A new type of smaller fire engine has been deployed in Plymouth to allow better access to narrower or more crowded streets, the fire service said. 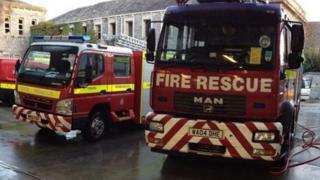 The light rescue pump can do the same job as its counterparts, Devon and Somerset Fire Service said. A spokesman said it is half the weight of traditional engines which often weigh more than 12 tonnes. The appliance will be based at Greenbank station and carry a crew of five firefighters. Fire officers said it was also useful in areas where many cars were parked. Group manager Rick Selley, of the fire service, said: "There are some very narrow streets in the Barbican and Greenbank areas; and with more traffic and on-street parking, it can be difficult for our fire engines to get around. "The new vehicle could save precious time, which could mean the difference between life and death."